As a customer service rep in the accounting and finance sector, you must highlight a few key skills and traits for your potential employers, including your initiative, patience, and ability to learn quickly (especially regarding the organization’s programs and offerings). Use your resume to describe your accomplishments in all three areas, and start by breaking your document into distinct subheadings. Create a section for your education, your past positions, and your core competencies. 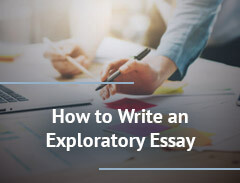 Start with a summary that places great emphasis on your people skills and general smarts. 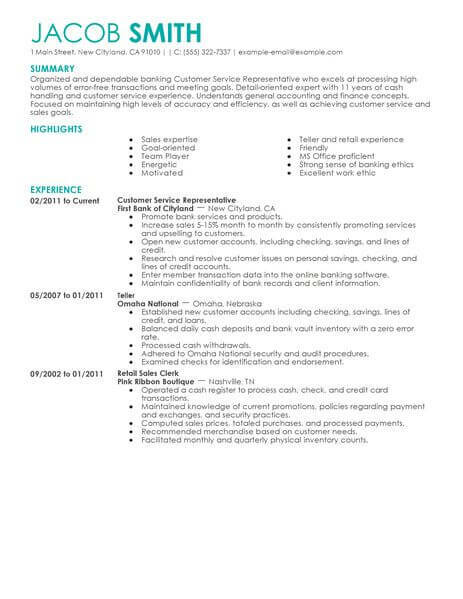 As you fill in each section below, use this customer service representative resume example as a guide. 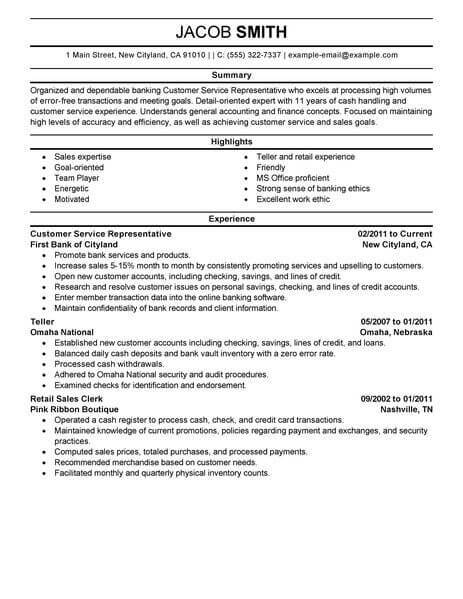 If you’re looking to become a customer service representative for a financial company our resume could make the all the difference. 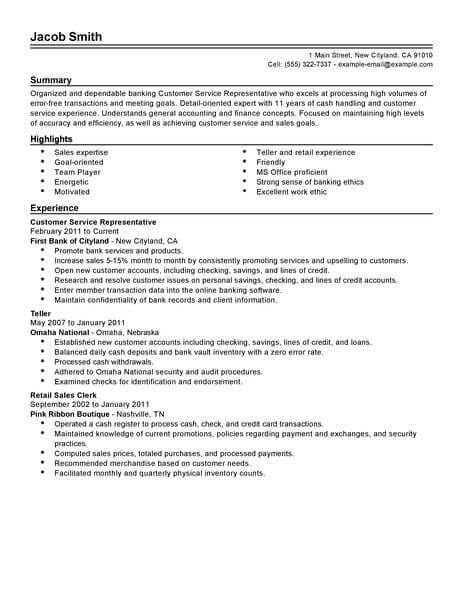 Our customer service representative-specific resume examples will help you focus your resume on the skills and experience employers are looking for. They’ll help give you the language you need to best showcase your customer service talents to potential accounting and finance clients. Click on any of the resume examples to build a better resume. 1. Update your resume, and tailor each cover letter to fit the prospective job. 2. Prepare for a long search. The job hunting process takes longer than ever and it is important not to get discouraged. Find out if you qualify for any benefits, or decide if you need to take a part time job during the process. 3. Maintain a positive attitude. It is easy to get discouraged when things don’t go your way, but when you are positive and persistent you have a better chance. 4. Network extensively both online and in person. Job opportunities that are not available to the general public can come from your professional connections, and it could also be a way to get access to hiring managers. 5. Practice your interview skills with either a friend, family member or with a professional. Read about common questions asked to applicants in your industry so you won’t be caught off guard. 1. Try using a resume builder or template when creating a brand new resume to find a pleasing format. 2. View industry specific resumes to see what others in your field are including. What are some trends and keywords for your job sector? Look for ideas on how you can stand out in your field. 3. Do not include high school information unless you just graduated from high school. 4. Use reverse chronological order for job experience, unless you have a huge employment gap. 5. Action verbs will make your resume come alive and highlight what you have accomplished. Include measurable results as much as possible.